The local cortical network consists of specifically interconnected neuronal populations (see  for review). This microcircuitry determines the possible interactions between neurons and thus may play a crucial role in shaping neuronal activity. We investigate the dynamical implications of the specificity of connections in the local network by means of large-scale simulations  of a spiking layered network model. To this end, we quantify the specificity of connections measured by diverse experimental techniques. We identify a hierarchy of specificity (Figure 1): Layer-specific connections (A) depend on the layers of the pre- and post-synaptic populations. Among the most prominent layer-specific connection profiles is a feed-forward pattern of connections (layer 4 (L4) to L2/3 to L5 to L6) which is closely linked to the tuning properties of cells in the primary visual cortex . Target-specific connections (B), in addition, depend on the neuronal type of the target neuron . 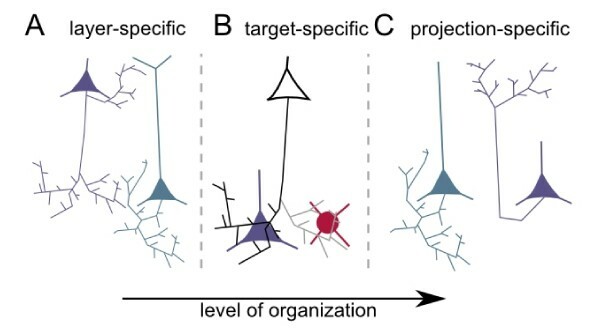 Projection-specificity (C), finally, classifies neuronal subpopulations of a layer according to the main target layer of their axonal projection (see  for review). The hierarchy of specificity in the layered cortical network model. Our layered cortical network model consists of 80,000 I&F neurons and explains about 90% of the synapses constituting the local cortical microcircuit. As we focus on the relationship of connectivity and network activity, we use identical dynamics and parameters for all neuron types in the network. Despite this homogeneity, we observe that the layer specific connections alone cause layer- and type-specific firing rates: excitatory firing rates are lowest in L2/3 (often below 1 Hz, comparable to ) and highest in L5 and inhibitory firing exceeds excitatory rates. Furthermore we find that a small subset of target-specific connections  is relevant for the stability of network activity. Finally, the incorporation of projection-specificity enables us to investigate the influence of fine-scale connectivity on global activity patterns. We conclude that specific connections represent a structural correlate of the experimentally observed network dynamics. Partially funded by EU Grant 15879 (FACETS), BMBF Grant 01GQ0420 to BCCN Freiburg, Next-Generation Supercomputer Project of MEXT, Japan, and the Helmholtz Alliance on Systems Biology.